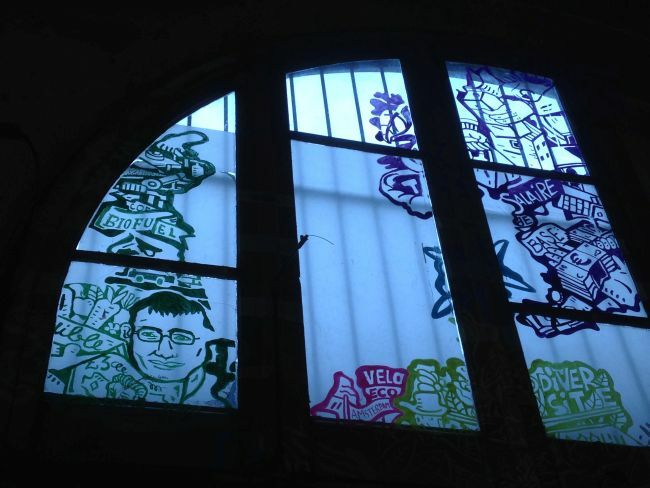 In which I visit an extraordinary venue in Paris and find myself painted on a window. 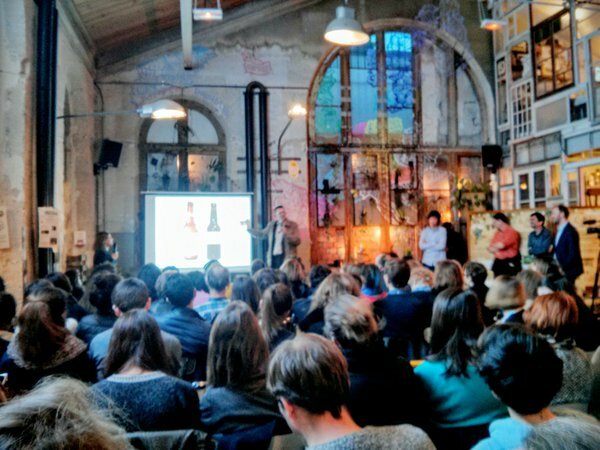 I was in Paris yesterday to speak at a place called La Recyclerie, at the invitation of UpCafe, an organisation that runs a series of talks about social innovation and sustainability. 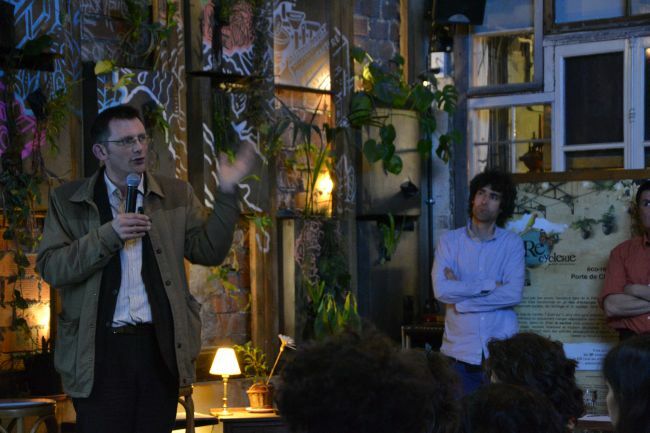 The event had sold out several weeks ago, due, in part, to the ‘Demain effect’, as the number of people who have now seen the film passes 800,000. 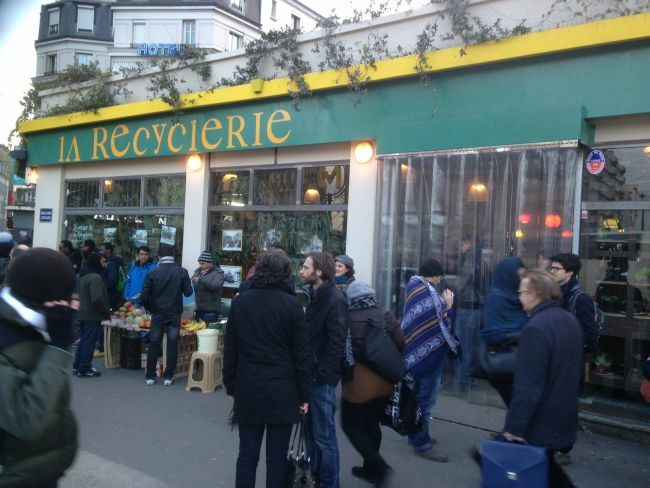 La Recyclerie is an amazing place, based in an old train station that closed down decades ago and has been renovated and restored into an amazing demonstration of permaculture/Transition/recycling in the heart of Paris. At the heart of La Recyclerie is the cafe/bar, which provides drinks and also meals made with (where possible) local ingredients. Nothing too exceptional there, but it’s what the cafe then goes on to subsidise that is really fascinating. 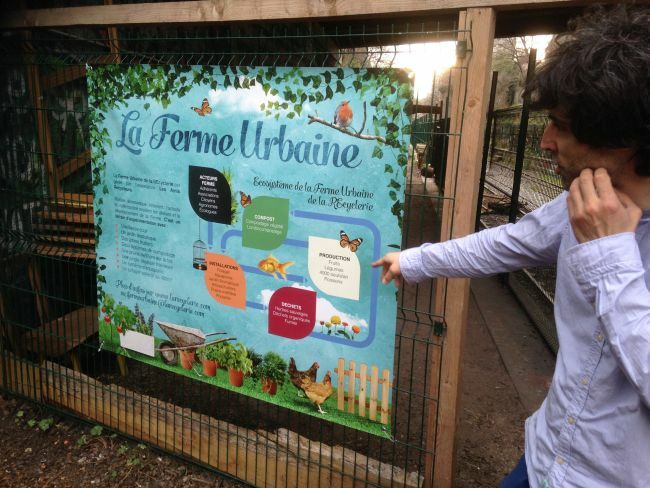 I was taken on a tour around the Ferme Urbaine (Urban Farm), which has been created in a long railway cutting out the back of the building. 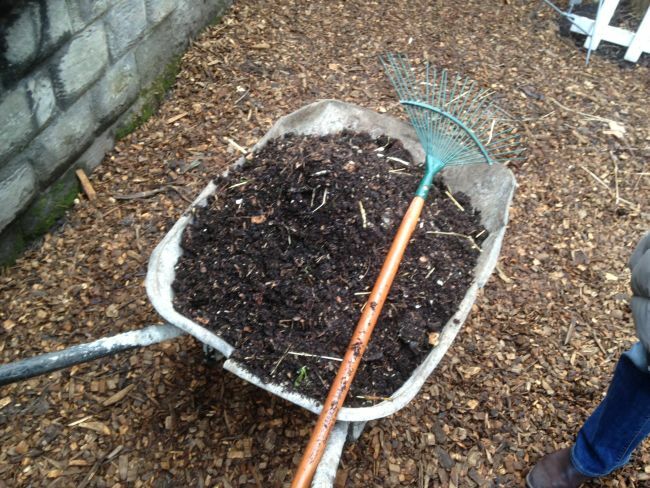 All of the cafe’s waste food is composted in a series of compost bins, and the garden’s raised beds are built and fertilised using that compost. There are also experiments in hydroponics which they plan to expand soon, rearing fish for use in the restaurant. The garden is maintained by lots of volunteers who gather once a week to work on it. 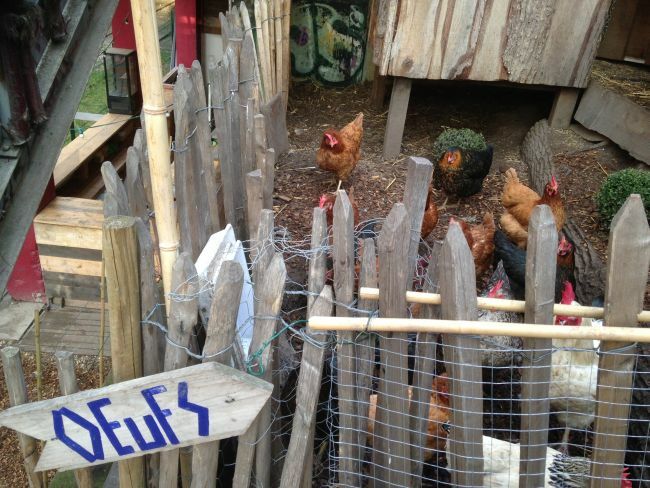 It features an aromatic plant garden and fruit trees and bushes on terraces cut into the slope, 20 chickens and two ducks, a 400m2 vegetable garden (which given the shape of the site is very long and narrow). 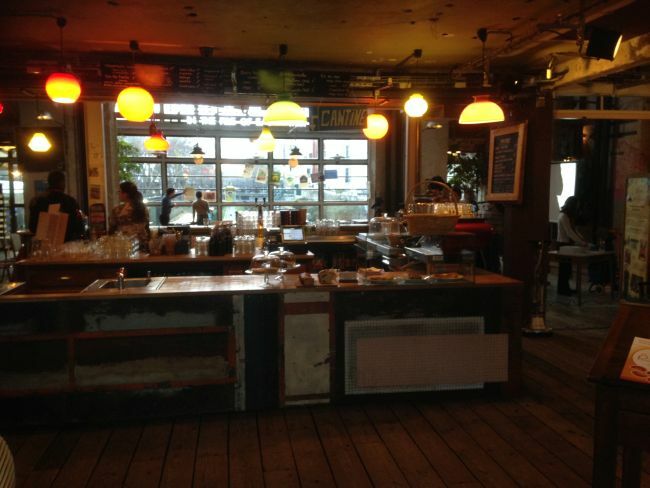 Everything in the place, from the tables and chairs in the cafe, to the chickenhouse and outdoor planters, is recycled. It was all very impressive. 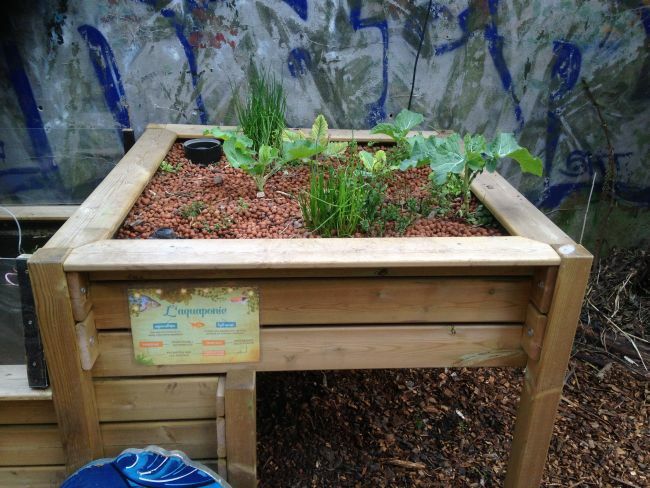 One of their experiments is into the impacts of compost on soils that were previously polluted. Being alongside the railway line, the soils included traces of lead and arsenic among other things, and so their work has included regular testing to see the impacts of adding large amounts of compost to the soils. To nobody’s particular surprise, levels are falling sharply. 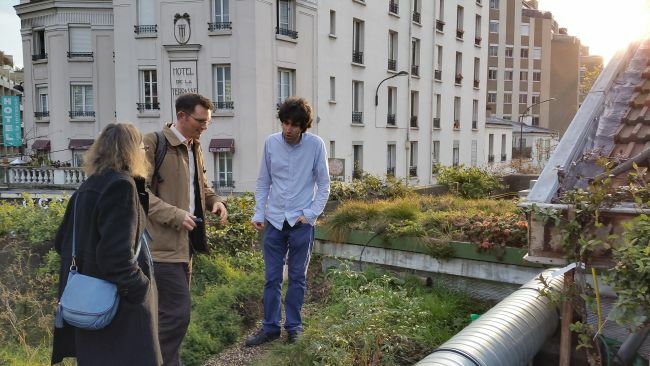 We were shown the living roof, not accessible to the public, but of which the Recyclerie team are very proud. 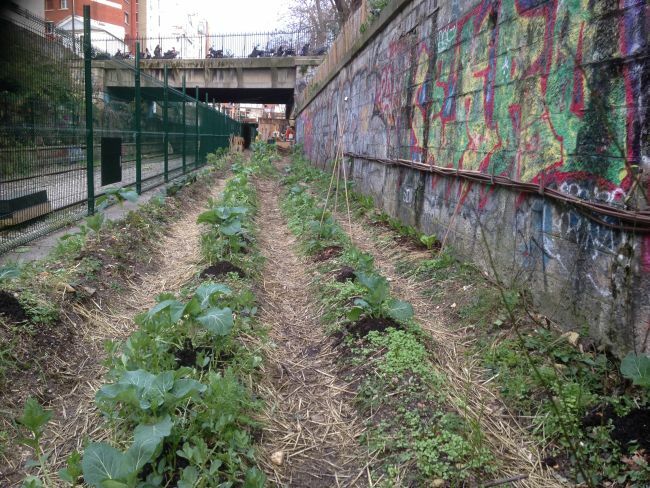 The roof had a good depth of soil added to it and was then planted up with 50 varieties that are good for bees. Future plans include adding beehives to the roof. 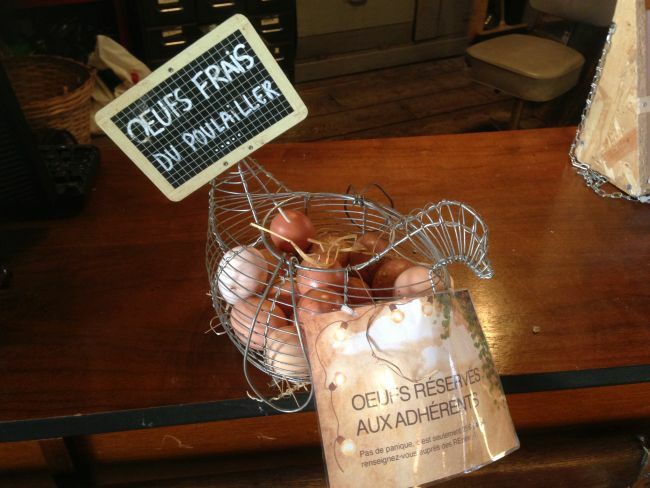 They were also experimenting there with growing mushrooms on their waste coffee grounds. 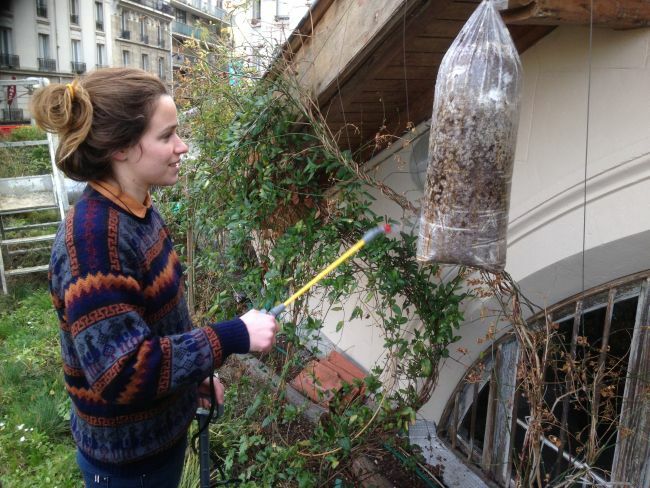 It was quite something to be standing, looking out over one of the busiest parts of Paris, standing amid a bee garden. I imagine in the summer it’s pretty spectacular. “The city is wilder than you think, and kinder than you think. It is a valley and you are a horse in it. 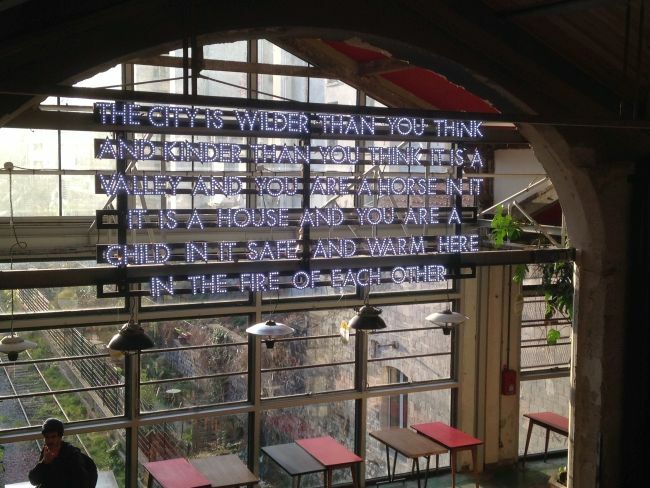 It is a house and you are a child in it, safe and warm here in the fire of each other”. 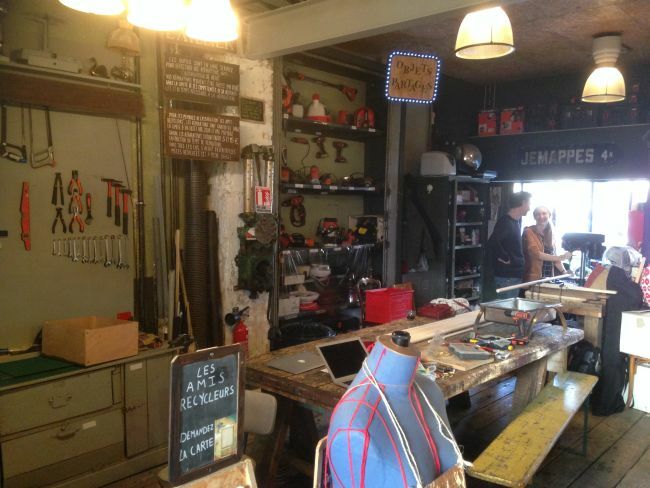 There was also l’Atelier de René, a permanent Repair Cafe in the heart of the building, with a Tool Library and all manner of reskilling workshops taking place throughout the week, and people dropping in to work on a variety of projects. Painted on one window in the main room was a painted map of Europe, which included a slightly alarming portrait, apparently, of me in the part meant to represent the UK (!). Then Corinne talked about Transition in France and how people could get involved. After some Q&A time, there was lots of book signings, selfies and chatting to people. Met lots of lovely people and had some great conversations. 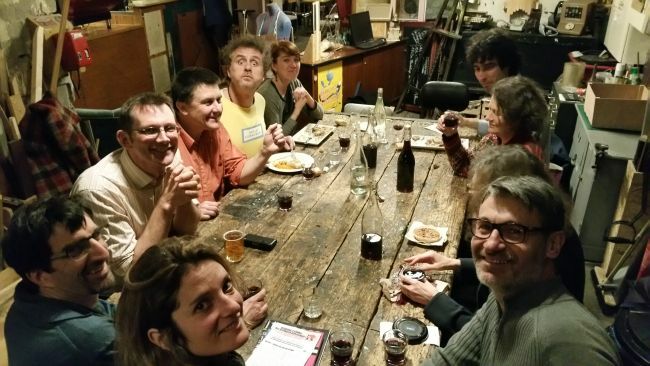 Once that had all calmed down, I could sit with various French Transitioners to eat, talk, and sample some of Paris’ interesting craft beers (I had a white wheat beer with chai, which was so-so) before heading off out into the night. 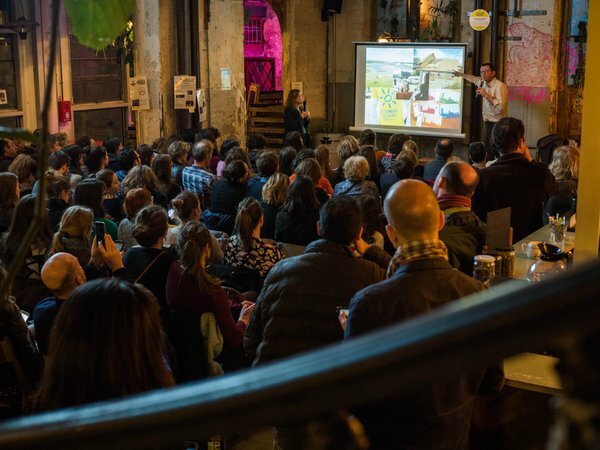 My thanks to everyone at La Recyclerie for their hospitality and for the tour of their great project, and to Up Cafe for the invitation, and to all the French Transitioners for their welcome, hospitality and kindness.